The moment you step into the gates of Walt Disney World, you instantly become mesmerized! The smells, the sounds, the sights, and the vendors surround you and you want to do everything at once but know that it isn’t possible. You want to eat everything, ride every ride, and buy all of the amazing and adorable Disney gear and souvenirs that are calling you by your name. The Disney vendors and shops are fun, colorful, and filled with excitement, but sadly too often they sell overpriced items that you can stock up on before you arrive at Disney. 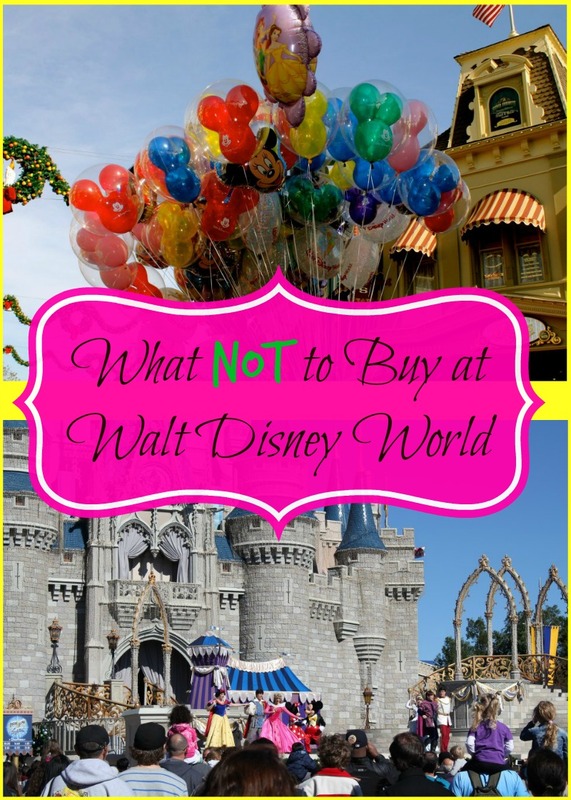 After visiting Walt Disney World a handful of times over the years, I have learned a lot and want to share with you what not to buy at Walt Disney World. Autograph Book– Most kids love to have the characters sign an autograph book. Instead of spending a lot of money on one, purchase one outside of the park or make one. Autograph Pen– If you have an autograph book, you need a pen so the characters can sign your autograph book. 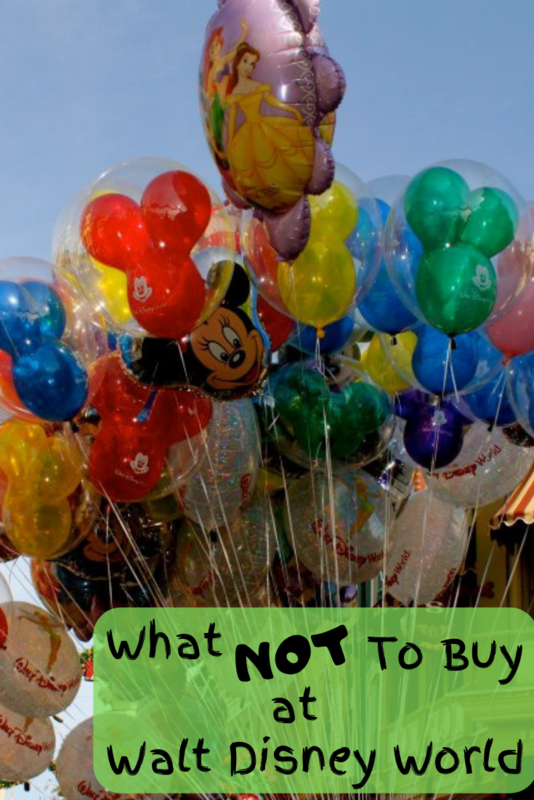 Disney Trading Pins– If you trade Disney pins for fun, then you should avoid buying Disney pins at Walt Disney World and instead purchase them in bulk online. There are many reputable companies online that will sell you a miscellaneous variety pack that is perfect for the non-serious pin trader. Disney Pin Lanyard– It is important to have a lanyard to hold your Disney pins. Glow Sticks– There are so many vendors that sell glow sticks and glow in the dark fun during the night time shows and parades. Save the money and the headache and purchase these in bulk online or at a dollar store. Rain Poncho– During the random rainy season, you will want to make sure that you invest in a poncho. These are sold at Disney but they are cheaper outside of the park. Disney Trinkets – From tattoos to hair bows, you and your child will want to represent Disney and fun trinkets can be found outside of the park for great prices. Snacks– Food at Disney is very expensive, especially if you have kids that love to graze all day. Pack enough snacks to get you and the kids through the day. Disney Stuffed Animals– Who doesn’t want to snuggle a Mickey Mouse stuffed animal or a Dumbo stuffed animal when you get to your hotel after a long day? You can purchase some fun stuffed animals outside of the park and surprise your little one with one when it’s bed time. Disney T-Shirts – When I am at Disney, I like to wear Disney from head to toe! Instead of buying Disney shirts at the gift shops, I like to purchase a few throughout the year at different stores to save a lot of money. Bottle of Water– Bottled water is expensive, so I like to bring a refillable water cup so I can refill it for free throughout my time at the park. Umbrella– This is great for the rain but also to protect against the sun during the hot summer months. Sunblock– It’s much cheaper to buy sunblock at your local grocery store and it’s a must have during the summer months. Medicine and Band-Aids– It’s a theme park, so you are guaranteed to get a headache and your kids most likely will scrape a knee. Save money and be prepared. Why Disney’s Art of Animation is NOT for Me and more. I think your missing out on something buy buying everything before hand. all my children have a very special place in their hearts for their Mickey stuffed animal that they got to pick out at Disney world. I don’t think it would hold the same meaning to them if it just showed up in their room at night. I trade pins, and unfortunately have never run into a “reputable” pin dealer online selling in bulk. Those are scrapper pins. Its definitely important to do research on pin trading before you jump in! A better option, in my opinion, would be to head over to the Disney Character Warehouse outlet store or Theme Park Connection to find discounted pins. They are direct from the parks, just being phased out. Just a note… If you bring your own pen for autographs, understands why they sell those giant, bulky pens… The characters ‘hands’ are bulky gloves that are hard to feel through. So the big pens are easier for them to grasp and user. So if you want to bring your own, that’s fine. It’s courteous if you can bring something easy for them to handle. I thought over-the-counter meds and bandaids were free at Disney, aren’t they? I have never heard that? I am sure if you got a cut at the park that you could walk way far to First Aid and get a band aid but OTC meds? Yes, all of the first aid stations in the park offer free band aids and otc medications. I have been to the first aid stations many times in the park, they will give you band aids and ointment for cuts and scrapes. I would say buy the autograph pen and the book I did and I love it! And I got the rain pancho I love my and I get to reuse my to!